Okay, I’m going to share with you the best ways to prepare for the speaking part of the exam. 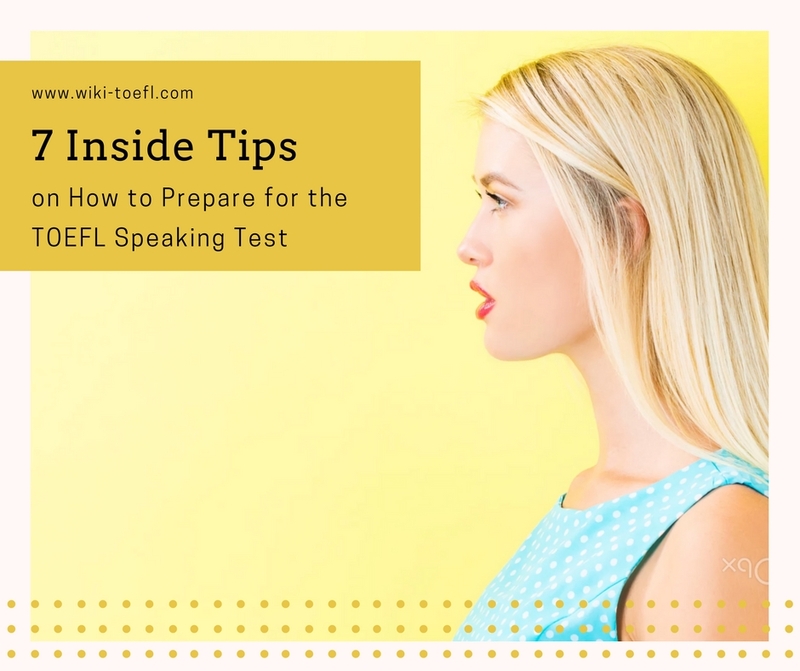 Taking a speaking exam can be challenging even in your native language, so these pointers will really help you feel confident and be well prepared. Here are seven inside tips to maximize your score on the speaking part of the TOEFL test. First, take a look at the structure of the test so that you know what you’ll have to do on the day of the exam. But more than that, by looking at the structure of the speaking test you can start thinking about the best way to prepare for it. In tasks one and two, you have to give a 45-second speech and you’ll have 15 seconds to prepare. In these tasks you need to demonstrate your ability to speak clearly and logically about familiar topics. The ideas you use should come from your own personal experience, not from academic material presented to you (like in the following tasks). Each independent task has two parts: whatyou should discuss and how you should organize your ideas. What are the characteristics of a good colleague? Use reasons and details to support your response. In this task, you have to speak about the characteristics of a good colleague (coworker). The second sentence tells you how to organize your response—using reasons (why you think a certain characteristic is important) and details (describe your idea of a good colleague). If you only give reasons and forget about the details, you’ll lose points. If you could live anywhere in the world, what place would you choose? Use reasons and examples to support your response. In this task, the topic is the best place to live in the world. Don’t forget to say why (the reasons) it is the best place for you, and to give examples of what you mean. In these parts you are going to read a passage of 100-120 words on a campus-related topic. Then you are going to listen to a passage from a campus situation (in task 3) and an academic passage (in task 4). You get 30 seconds to prepare and one minute to speak about how the reading and the listening passage are related. While you read and listen, you should take notes on the main points so that you can later speak about how the two parts are related. If you know what to expect in the exam, you’ll feel more confident. Be ready to read fast and take quick notes, and then listen to check how the two parts are connected. The more you practice by doing exam-like tasks, the better you’ll get. In task 5 you are going to listen to a conversation of around 2-3 minutes on a campus-related topic. In task 6 you’ll hear part of an academic lecture of the same length. You have 20 seconds to prepare and then one minute to speak about the main points of the listening passage. This time you don’t get a reading passage, but the listening section is longer. You’ll have to take notes while you listen so you don’t forget the main points. You only get the task after you finish listening, but you can’t go wrong if you take notes on the main ideas. Answer to question: This criterion refers to your ability to understand the task and speak about the topic in a way that is relevant. For example, if you are asked to give reasons and examples, you should do just that. If you forget about giving examples or give details instead, you’ll lose points. Comprehensibility: This one refers to how well you can be understood. If someone can follow you easily, then you’ll probably score high in this criterion. Organization: If your answer is clearly organized and developed, you can score high in this criterion. Read on for further tips on how to organize your speech. Fluency: If you can speak without hesitations and your speech flows naturally, you’ll score high in fluency. Pronunciation: If you can pronounce individual sounds correctly, get word stress right and have good intonation, you’ll do just fine in this criterion. Remember, pronunciation is not about accent. Almost all non-native speakers have an accent and this will not make you lose points. Grammar: This refers to your ability to use advanced grammatical structures and a high level of accuracy. Vocabulary: This one is about proving you have a wide range of vocabulary which you can use accurately to say what you mean. Answer to question: Even if you don’t have a lot of time left, you must make sure that every time you read a speaking topic, you notice the key parts at first sight. Make sure you give reasons if they ask you for reasons, and details if they want details. Comprehensibility: The best way to ensure you are comprehensible is to have someone listen to you speak. Did you know you can find native speakers online to help you with that? Verbling is the place to start looking for a native English speaker who can be your own personal tutor—and you can even find someone who specializes in teaching English for the TOEFL exam. If they can understand you, you’re on the right track. If nobody is available to listen to you or you feel nervous about it, record yourself and listen to your own speech.Whether you choose to speak to a real person to practice or to just record yourself, remember to have the structure of the TOEFL speaking test in mind. It may be more practical to practice improving your comprehensibility with tasks 1 and 2, as you only need a topic for each task. You can find a list of topics here, and then try to simulate (copy) exam conditions. Give yourself 15 seconds to prepare and 45 seconds to speak. Repeat until confident. Example task: What are the characteristics of a good parent? Use reasons and details to support your response. Topic statement: The two most important characteristics of a good parent are friendliness and ability to set limits. Reason: Friendliness — If parents are friendly, kids will feel like they can always trust their parents and then the children will be friendly as well. Detail: Kids tend to imitate their parents’ behaviors, so if a parent is friendly they will set the right example. Reason: Ability to set limits — If parents can set limits, they’ll guide their children through what’s good and bad. Detail: Kids need limits within which they can feel safe. Even if children tend to test these limits a lot, they still need their parents’ guidance. If you have a bit more time until the exam, you can also improve the other criteria, which involve language skills that take longer to develop. Fluent speech—speech which flows naturally—is something you develop over a long period of time. Fluent speakers can find their words faster, even when they’re not quite sure what to say. This is also directly linked to vocabulary (see below), as hesitations usually happen when you can’t find your words. In any speaking exam, you are given a limited time to speak. Learning a few phrases that can be used frequently will help you with fluency. You can find more transition phrases to help you throughout the speaking test here. It’s very important not to worry about your first language accent; pronunciation is different from accent. You can improve your pronunciation by paying attention to the sounds that don’t exist in your native language, as these tend to be mispronounced. For instance, do you have problems saying “the” or “thin”? That’s probably because you don’t have the “th” sound in your native language. You can improve your pronunciation by reading out loud, or listening to native speakers and then trying to imitate them. Try recording yourself as you speak on your own and check out how close you are to the right pronunciation. You can do this by reading out transcripts of podcasts and then listening to the podcasts to check your pronunciation. This series of English podcasts will give you clear, high-quality audio with transcripts and learning materials. This is perfect for practicing your pronunciation! Also, every time you learn a new word, make sure you learn the correct pronunciation with it. Most online dictionaries have a little speaker sign next to the word’s definition. Click on it to check the pronunciation of words that you look up. But remember that the most important part is to make yourself understood, not to try to sound exactly like a native speaker. Taking notes is key when reading and listening in the integrated tasks, and when preparing. Time is limited, so you can’t write down entire sentences. Instead, learn to focus on the key words as you read and listen. The key words are very important, as they will sum up the main ideas of the reading and listening passages so you can use them in your speech. Practice taking notes while listening to podcasts and TED talks, and while reading academic articles. Make sure you practice using your symbols until you’re comfortable with them. If you don’t practice with them, symbols may confuse you or slow you down during the exam—which we obviously want to prevent. Knowing your symbols well can definitely make your note taking faster and more useful. By following these seven tips, you can become very well prepared for the speaking test. Remember, a test is simply there to check what you know. Your examiners test students like you every day, and want you to succeed. It may be intimidating to have to speak for a limited time, but it’s the only way candidates can be given a fair chance to be evaluated. Use these tips to practice every day, and you’ll be able to give your best on exam day!